Have you guys ever had pineapple curd? It’s sweet and tangy with a little zing in the background. I made this super delicious breakfast pastry which I would happily sell if I had a charming little cafe in the leafy lanes of Pali Hill in Bandra. I love making brioche dough because it can become the foundation for so many delicious things. 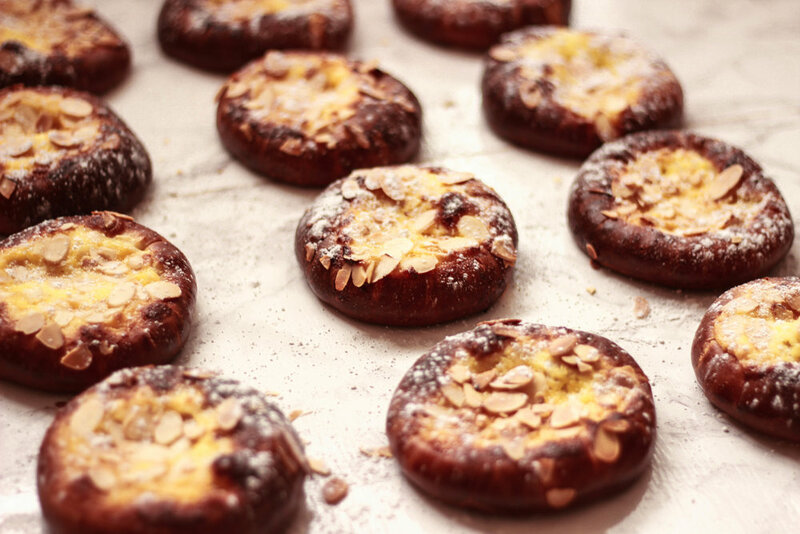 Doughnuts, cakes, babka, buns and in this case a sweet pastry with pineapple curd, cream cheese and almonds. I debated between filling it with lemon or pineapple curd and glad I went with the latter because it paired perfectly with the slightly tangy cream cheese. Its a fairly simple recipe which I have outlined below but you need to plan a little so you can have these warm from the oven for breakfast. BRIOCHE DOUGH - Recipe from Chef Sim Cass ,Institute of Culinary Education. Whisk all ingredients together in a medium sized saucepan. Place over a low heat and whisk until thick, about 4 minutes. Allow to completely chill before using in the cake. Whisk all ingredients together until its incorporated properly and is smooth. Next day, remove the dough from the refrigerator and let it come to room temperature. Preheat the oven to 190°C and line a baking tray with baking paper. Divide the brioche dough into 12 even pieces. Roll out into circles about 5-7mm thick. Transfer to the baking tray. Brush the outer cm of each circle very lightly with water and fold the outer edge in towards the centre, creating a rim. Cover with a clean tea towel and leave to rise for 15 minutes in a warm place. I leave it on my kitchen counter where its always sunny. Divide the cream cheese evenly between the eight rounds, and spread with a knife over the brioche surface. Then spread a tablespoon of pineapple curd and sprinkle the tops with sliced almonds.